This Daily Content series on pre-dreadnought battleships concludes with the ships of the Kaiserlich und Koniglich Kreigsmarine, the Austro-Hungarian Navy. I slightly shudder at my temerity in covering this, the beloved preserve of Mike Bennighof, but bravely continue. One issue needs to be addressed at once: the obvious discrepancy between the competency and success of the K.u.K. armies and navies. Anyone who reads about the Eastern Front in the Great War is struck by the profound weaknesses consistently displayed by the Army � whether Imperial, Honved or Common Army seems to make little difference. Its problems started at the top, with Chief of Staff Conrad giving new meaning to the word "inadequate," and then encompassed weaknesses in material, supply and above all in an officer corps dominated by aristocratic and detached Austrians. In total contrast the Navy had well-designed ships, motivated officers, well-trained crews and a far better leader than Conrad in the form of Admiral Anton Haus. It was fortunate to avoid much of the bickering and conflict between the Austrian and Hungarian parts of the empire that crippled the army and seriously damaged the morale of its Croat and Czech components. The one factor that constantly impinged was that the Hungarian parliament eventually insisted that at least one-quarter of all new ships had to be built at "their" shipyard at Fiume. For a number of reasons this was less efficient than the main shipyards at Trieste and Pola. Undoubtedly the fleet benefited by refusing to adopt "regional" crews, with instead a typical ship being manned by Croats, Hungarians, Austrians, Czechs and Italians in descending proportion. Mutiny and desertion did not become an issue until late 1917 and then only in a few ships. The "coast defender" Wien, in happier days. Despite, or perhaps because of the triumph at Lissa in 1866 (see the upcoming Ironclads: Hearts of Iron) the Austro-Hungarian navy in the 19th Century only built heavy warships suitable for the narrow waters of the Adriatic Sea. The earliest given counters in Mediterranean are the three small (only 5,500 tons) coast-defence battleships of the Monarch class. On paper they were impressive, with their four 24cm (9.4-inch) main guns backed up by six 150 cm (6-inch) and protected by over 12 inches of Harvey steel. However they had barely enough range to travel the length of the Austrian coastline at cruising speed and were given very little reserve buoyancy. During the Great War they were considered dangerously obsolete but risked when needed. At first they were stationed at Cattaro in the south from which in 1915 Budapest went to sea to save some threatened light craft. In October 1917 Monarch and Wien moved to Trieste, sailing on several occasions to bombard Italian coastal facilities. Two months later Wien became the first large Austrian warship loss when torpedoed at anchor in Trieste by Italian MAS (motor-torpedo boats). The two survivors were scrapped in 1920. Battleship Arp�d, one of Austria's first sea-going modern battleships. The first genuine sea-going battleships were the three Habsburgs of 1899. They were still small by international standards � only 8,500 tons when the British and French were building ships which averaged over 5,000 tons more. The cost of a reduced displacement was evident, with the aft turret mounting only one instead of the expected two 24cm guns. However they improved on the Monarchs by carrying twelve 150mm secondary guns, could go three knots faster at 20 knots and, above all, had a healthy radius of action. Like all Austro-Hungarian capital ships they were well-protected (220mm of Krupp armour) against enemy guns. During the war they were grouped in the IV Battleship Division and saw no action until decommissioned (after the sinking of Wien), freeing their officers and men for service in the new light cruisers and destroyers. All three were scrapped in 1921. The choice of names for the ships illustrates the careful balance needed to maintain solidarity in the empire. They were named after three royal houses: Habsburg the ruling Imperial family, Arpad the first Magyar ruler in what would become Hungary and Babenberg the earliest rulers of Austria. Bizarre though it might seem to an outsider, it was also specified that when the three ships were together, Habsburg was to be the division flagship! Erzherzog Ferdinand Max runs at speed. The next pre-dreadnoughts, Erzherzog Karl, Erzherzog Friedrich and Erzherzog Ferdinand Max were authorised in 1902. The Trieste shipyards were still limited in the size of ship they could build, so these at 10,500 tons were still considerably smaller than foreign warships. This meant that they could still only carry 9.4-inch guns, a crippling disadvantage when other designers were now mounting 12-inch weapons. At least the Archdukes had four heavy guns, backed up by a much stronger secondary gun set of twelve 19cm (7.5-inch) weapons, all mounted in efficient two-gun turrets. Since it was obvious that the ships would need to face and evade more heavily gunned opponents two features that characterised Austro-Hungarian battleships were emphasised. They were given a high speed (20.5 knots) and were very well protected for their size against enemy shellfire. As an example their belt and deck were 25 percent thicker and of comparable quality to the contemporary British-built Mikasa, the Japanese flagship.They formed III Battleship Division and saw no action. Despite this they must have been well-officered and manned because in February 1918 they were sent from Pola to Cattaro with orders to subdue the mutineers on the armoured cruisers Sankt Georg and Kaiser Karl VI. The three ships were all broken up in 1920. 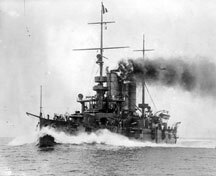 The next battleship class was laid down in 1907. Since full details on HMS Dreadnought had been available for over a year one would expect them to be "all big-gun" ships. However instead they were among the last semi-dreadnought battleships to be built. The navy had a new designer, Siegfried Popper, who pointed out the maximum conceivable displacement possible until the Trieste and Fiume shipyards could be enlarged was about 16,000 tons. On that weight he could mount no more than eight heavy guns with barely adequate protection and reduced speed. Instead it was decided to install four 30.5cm (12-inch) and eight 24cm guns, all in twin turrets. As usual armour protection was good with a nine-inch (230mm) belt and Popper�s own patented underwater defence system � although in view of the seeming ease with which other of his designs succumbed to torpedo or mine this many not have been an advantage! As was customary the ships were grouped, in their case into II Battleship Division. They saw more action than other large ships. The new Viribis Unitus class battleships were only sent to sea on rare occasions. However the Radetzky (named after the Austrian general who defeated the Italians in 1848 and 1849) class could be risked. The name-ship opened fire on French field batteries at Cattaro in October 1914, staying there to help the three Monarch class, charged with supporting destroyers and light cruisers operating in the southern Adriatic. In the following year she and her two sisters, Erzherzog Franz Ferdinand and Zrinyi (rulers of Hungary and Croatia in the 17th Century) bombarded ports and railways along the Italian Adriatic coast. Although the damage was slight it affected Italian morale and forced the British and French to deploy additional heavy ships in the region. The rest of the war was much less exciting and all three were scrapped in Italy after the war. All three Radetzkys in their usual haunt: at anchor in Pola. As with the other semi-dreadnoughts whose counters were produced in earlier games these need to have their gunnery strength modified. I would suggest a value of 3-5-3. Note the higher tertiary value. Operating as they were in narrow waters, the Austro-Hungarian navy had a healthy (and it was to shown justified) respect for Italian light craft. The Radetzky class was given no less than twenty 4-inch guns, as well as the usual smaller automatic weapons. As these ships were being laid down the navy was changing from its traditional three-ship to the more common four-ship division. Radetzky and Erzherzog Franz Ferdinand were laid down in 1907, Zrinyi two years later as workers became available. Had the shipyard expansion not been completed a fourth unit would have been laid down. Considering how many "possible" ships appear in the Great War at Sea series, I think it proper to add this one. Editor's note: Austrian warship names were proposed by the Navy and approved by the Kaiser and the fourth Radetzky already had a proposed name: Hess, in honor of Heinrich Hess, the emperor's personal military tutor during his youth and thus the sort of name that would gain Imperial favor in political disputes. The other names proposed, Tegetthoff and Laudon, were used for later dreadnoughts. All these names come from Austrian military history; Hungarian and Habsburg names were limited by unofficial understanding to one each per class. You can download the variant counters here. And you can order Mediterranean here, to send them to sea!